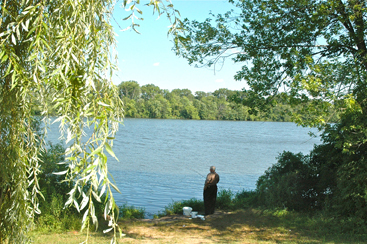 SUNDAY, BEFORE THE BIG HEAT: Even in the shade, fishing in Lake Carnegie might not be such a good idea this week, with heat index values that could reach 105 to 110 degrees. The excessive heat warning is in effect until Friday and will be reevaluated as the weekend approaches. Come next spring, the plaza that fronts 1 Palmer Square will be Princetons latest location for al fresco dining. Having obtained approval from the Regional Planning Board at its meeting last Thursday, Palmer Square Management and Winberies restaurant are ready to turn this under-utilized stretch of concrete into a busy destination for dining and people-watching. Douglas McCune, 55, of Princeton was fatally injured in a cycling accident on July 16 in Clinton Township. He was riding on the final day of the annual weeklong Ride for Runaways in support of Anchor House in Trenton. Committeewoman Liz Lempert has reported that closing on the final agreement for the Townships purchase of the 14-acre Ricciardi tract on the Princeton Ridge is near. Speaking at Monday evenings Township Committee meeting, Ms. Lempert thanked the Ricciardi family for their flexibility and willingness to accept a slightly lower purchase price. This is kind of a secret garden, said Recreation Department Administrative Secretary Vikki Caines, leading a visitor past the thriving plants in a plot adjacent to the Recreation Department entrance. At first glance, the cardboard boxes and bubble wrap that line a large, empty room at the College of New Jersey (TCNJ) dont look like much. Dusty documents and dated pamphlets peek out of their makeshift containers. Rows of old circuit boards stand end-to-end. An excessive heat warning through at least Friday, July 22 has been issued for the central New Jersey area by the New Jersey Office of Emergency Management, in coordination with the National Weather Service. Heat index values (a measure of the combination of heat and humidity) could approach 105 to 110 degrees. The excessive heat warning is in effect until Friday and will be reevaluated as the weekend approaches. Speaking of Favorite Vacations: How About a Month in a Garden on Mykonos? New chamber music ensembles seem to spring up all the time  students get together at conservatory, young professionals meet in a large orchestra, and a new performing group is born. The members of the Voxare String Quartet came together at Juilliard, and in three short years have established themselves as committed to both a high level of performance and to play music of the 20th and 21st centuries. Violinists Emily Ondracek-Peterson and Galina Zhdanova, violist Erik Peterson, and cellist Adrian Daurov brought their new and fresh sound to Richardson Auditorium last Thursday night to a nearly full house at a concert in the Princeton University Summer Concert Series.